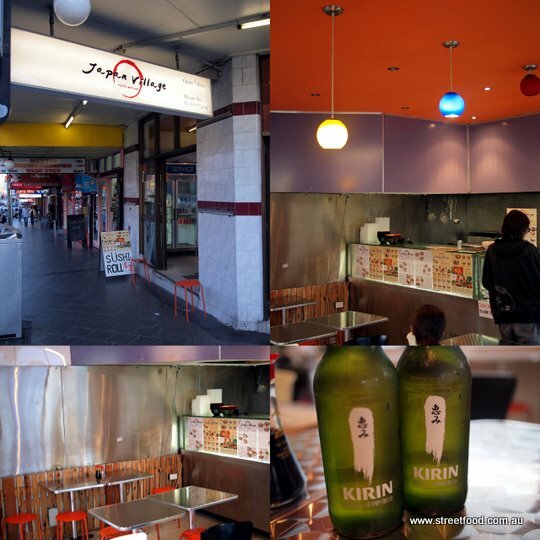 Japan Village pops up out of nowhere in on Enmore Road, Enmore. "There's good news and there's bad news" says Miss Chicken. The much loved Fine Red Corner on Enmore Road has closed down. It was a unique place that did good standard Thai as well as hamburgers, chook and salads. It had this bare corner location that, on a summer evening sitting outside with a few beers, reminded of us sitting in a street stall in Thailand. The food tastes Chinese or maybe Taiwanese cooked, it's not particularly good Japanese food, but it's cheap and tasty for what it is, and we're glad to have it as a stand-by when we're too lazy to go to Chinatown. Agedashi tofu - $5.50. Fried tofu in dunking sauce. Salmon Sashimi - $6.80. Both of these dishes are high up as our most favourite comforting foods. Chicken Oyako Don - $11.80. Chook simmered in egg and onions. Chicken Katsu Curry $11.80. A deep fried chook cutlet with rice and curry. Both the main dishes were quite big and come with a plethora of sides: omellette roll, seaweed, a little salad in dressing, a spring roll, seaweed and pickles. We drop in for a quick feed after work. The summer tan tan ($10.80) is ok for a Chinese cooked Japanese dish but a bit limp after having a killer tsukemen the week before at Ramen Zundo . The chicken oyoko don - $11.80 hasn't changed in a couple of years. Again, it's not great as far as Japanese goes but still a tasty feed. Poor old Japan Village has copped some flak from our Japanese readers in the comments below. In a sense the criticism is deserved. We are baffled by these folks who go to all the trouble of setting up a Japanese restaurant, then do a half-arsed job on the food. With a little research and effort, and probably very little cost, they could do things a lot better. On the other hand, this Chinese\Taiwanese\Korean cooked Japanese food has become it's own sub-genre that we have come to enjoy. It may not be proper Japanese food, but it's still tasty and has it's place in the wonderful world of food. We also appreciate Japanese versions of Western and Asian cuisines. Swings and roundabouts. The bottom line is that good Japanese joints are always packed, average ones are mostly empty. If we owned Japan village we'd do our darndest to pack it out every day of the week. This must be pseud-Japanese food cooked by Chinese or Koreans. Japanese people never eat salmon sashimi with lemon and green salad. The warmer the rice is, the better the Bento is but the cooler the sashimi is, the better. Not only these are off-setting either essence but also warmed up sashimi is deteriolated and sometimes dangerous. You should not take Japanese friends to this restaurant as they must be embarrased. Said ... I do not think this Japanese restaurant and Japanese. DON bowls and bowls for the first time DONBURI thing. The name of the instrument. Do not you put on your plate. Delicacy not feel fine. Negligence, the Japanese appear to favor reducing labor costs. Look no love cooking. Feel the difference in food culture. Man, the knives, er chopsticks are out today! I am not talking about discrete sashimi about temperature but Sashimi Bento in the photograph. Warmed raw fish deteriolates quickly and sometimes causes diarrhea. I do not care that western people go there at all but most of Japanese would not like that these food are thought authentic Japanese. Babylon is not good translation software, is it? He/she said, "I never feel delicacy from the food. It seems the cook put priority on labor cost saving by omission. I never feel the cook's attachment toward cuisine. I distinguish different food culture alien to Japanese one." Thanks for the more accurate translation Mr Wind Up Bird (my favourite Haruki Murakami character). You are staying in Japan now, aren't you? How about comparing authentic Japanese reataurants and this Japan village. Especially Osaka is called 'Town of eating to death'. We are back in Sydney Now - we went to Osaka in October but are taking our time writing about the trip. The Japanese here is very different, it is made for different tastes (like Japan Village) but there are many good very Japanese places in Sydney too - we are always searching for more! That Japan Village is not very Japanese, you know. A restaurant in US called itself Japanese one, which had caused serious trouble by serving harmful fish. One day, I had asked the concierge of my hotel which Japanese restaurant is tastier of the 2 in my map. I went to the one he indicated and it was fake. I tried the other one next day and it was authentic. Ironically, the one which westerners do not feel tastier is, as a matter of fact, authentic. the usual story for (most) "Japanese" restaurants in Sydney. Don't put everything in one dish. I agree anonymous - this place is a simple joint, it's not Tetsuyas, and the food matches the price. "It amazes me that people can pass so much comment on a restaurant without actually ever having eaten there! Try it and judge for yourself... "
Above guys are not saying the food is bad but just they are distinguishing the food is not authentic Japanese food cooked by Japanese chef. And some seem worrying about hygene problem and that such food is mistaken as Japanese cuisine. "Forget these idiots above comparing this with what they called 'real' japanese food." Here seems to have come one more idiot with no reading ability. Above guys are not saying whether non-Japanese are disapointed. Just they would like to tell not to take the Japanese there and to call it Oriental food or so. I think these food is cooked by the Chinese or Koreans and they are extraordinarily nationalistic so they should serve own food proudly. Can't wait to see if these critics knives be out when a famous Malaysian opens his Japanese izakaya restaurant in Surry Hills. So is the food good or bad??? Does it make you sick or feel nice and happy in the tummy??? This has all been very unhelpful. I just don't want to get chewy fish and rice with foreign bits in. Yes....no??? "So is the food good or bad???" It must be good for non-Japanese people but no good for Japanese people. Authentic Japanese cuisine is hard to be understood by non-Japanese people. The food at Japan Village is yum and makes this little (non-Japanese) black duck happy in her tummy. Usually I just get goyoza, takoyaki and seaweed salad, salmon sashimi is fresh and served cold! Also udon is tasty, filling and good. I've eaten there a lot, it's cheap and cheerful and the kitchen is clean and they practice appropriate hygiene standards. Loving this thread - Stimulating to the head and tastebud!! The combatants above are related by a love of food and a curiousity for new places and flavours. What Japan Village may do best is provide a simple, fun, entry level appreciation for many western diners into the world of japanese food, if not its traditions. I won't hold out for kaiseki with a garden view, but my palate will refine through comparisons of basic menu items, and provide a springboard for occasional forays into more authentic cuisine. I enjoy seeing venues such as Uchi Lounge in Surry Hills (essentially a sophisticated Izakaya) covertly translate traditions through a contemporary menu without excessive prices. Hmmm lots of people who never actually EATEN here from the sounds of it, making big calls. The bottom line with this place is; its cheap and cheerful and the food is good. Ive travelled extensively through Japan and eaten A LOT of Japanese, both good and bad...this place may not be 100% 'authentic'...but he gives a rats? Its a great place...I wander in, have a few beers and enjoy some great 'japanese' food...and it doesnt cost and arm and a leg. Long live the 'Village! We get a lot of comments from Japanese based readers who are very vocal about authenticity. We went here again the other night, did as you often do too and enjoyed it. It wasn't a leg trembler but it was tasty and we accept it for what it is.